Time, or more accurately the lack thereof, is the number one “pain point” most teachers experience. They don’t feel they have enough time to get through the curriculum, cover the standards, scaffold and reteach, provide timely feedback, and plan dynamic lessons. As a blended learning coach, I spend time in other teachers’ classrooms observing, co-teaching and coaching. It is common for the first 5-10 minutes of class to be consumed by housekeeping tasks–taking attendance, explaining the lesson, and getting the classroom set up for the first task. Teachers can take back this time if they rethink how they begin each lesson and communicate the parts of the lesson to their students. Instead of writing an agenda on the board or projecting it onto your smart board and guiding students lock-step through the parts of the lesson, teachers can create interactive agendas using Google Slides. It eliminates the time wasted at the start of class reviewing the agenda. Instead, teachers can train students to enter the class and immediately use their device to access the agenda via Google Classroom or a short Bit.ly link. It shifts the focus from the teacher to the students because they don’t need to wait for the teacher to cue every transition or provide materials for each activity. The materials can be embedded into the Google Slide agenda. It allows students more opportunities to self-pace through the lesson. It creates transparency about the timing of the activities and the trajectory of the lesson. It frees teachers to spend more time working directly with students instead of directing the parts of the lesson. Two years ago when I began using Google Slides to create my agenda for each day, I created a template for each of the types of lessons I typically design (e.g., Station Rotation, Whole Group Rotation, Flipped Classroom, etc.). That way, I could decide on the type of blended learning model I wanted to use for a given lesson, then “make a copy” of that template and create my agenda for that day. I work with teachers who use one slide for each of the activities they plan to cover in a lesson. That gives them space to articulate the objectives for that task and provide clear instructions. Google Slides also makes it easy to embed media and hyperlink to online resources. Many of the teachers I coach record short video instructions and embed them right into the slides. Shifting from writing my agendas on the board to creating interactive online agendas with Google Slides allowed me to spend less time answering the “what do we do…?” questions and spend more time working directly with my students. Instead of orchestrating the lesson, I spent more time in my role as a coach focused on supporting skill development or as an observer collecting formative assessment data. It was a simple shift that had a dramatic impact on both my role and my students’ role in the classroom. How old are your students? Do they have personal devices? Most of my students follow the agenda on their phones. Would you mind sharing the station rotation template? I would love to see it. Thank you for sharing your amazing idea as! Awesome idea! 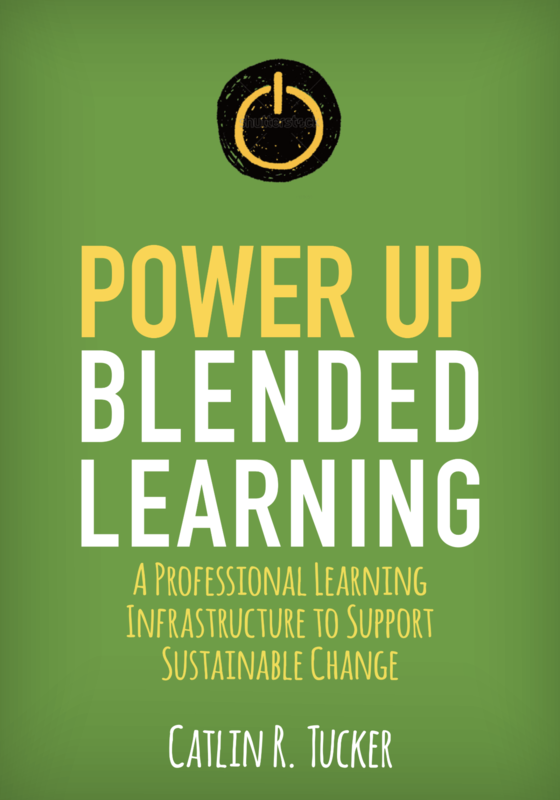 I am teaching a blended learning class this fall and had a question. I am using mastery grading and would like to know how many assignments you assign students per standard to demonstrate mastery. I’m worried too few will not show learning and too many would seem like “busy work”. Thanks in advance for the help. Typically, students have several practice opportunities then there is a single assessment. They are welcome to revisit, revise, and revamp any assessment to show growth and development in relation to a particular standard. How can this work for math? Since I’m not a math teacher, I can’t speak to exactly what this will look like for you but I’ve created a model lesson using this strategy that you can see below. Don’t be too hard on yourself, Lori! Do you know how many of my grand plans don’t get actualized? SO MANY 😉 That’s life as a busy teacher. Would you be interested in guest hosting a Twitter chat for #2ndaryELA? 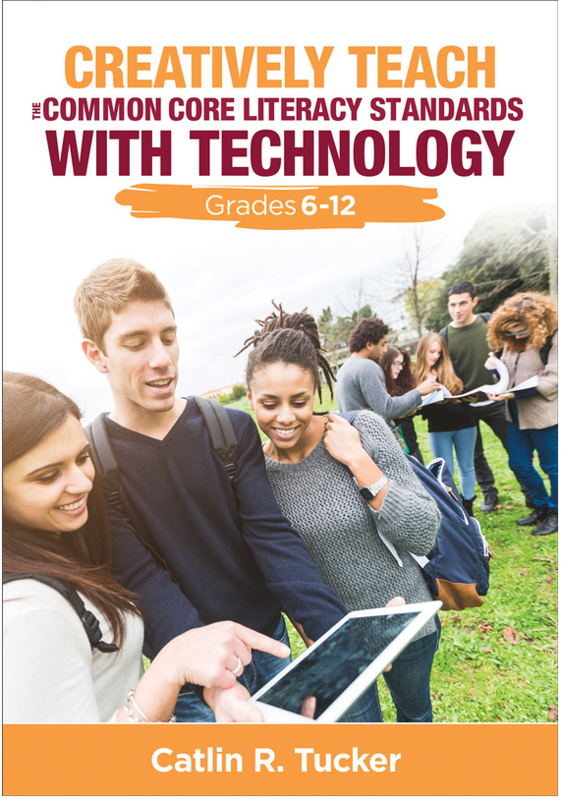 We would love to have you facilitate a discussion on any digital topic such as this one as the Middle and High School teachers we serve are working towards incorporating more and more technology into their lessons. We meet on Tuesday nights from 8-8:30pm and will be starting back up for the new school year in July. We hope that you will accept our invitation and look forward to hearing back from you. I apologize for the delay. I am currently in a doctoral program and my classes meet during the week at night. I do not have my schedule for fall yet, so I am not sure what my availability is yet. I should know by September 1st if you still need moderators at that point! Take care and thank you for keeping the #2ndaryELA chat going! Just finished reading Creatively Teach the Common Core…Grades 6-12. I mistakenly signed up for a class through USD thinking it was appropriate for 5th grade. Yes, parts can be modified, but much is geared toward high school. 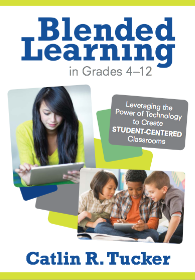 I do plan to buy/read Blended Learning in Grades 4-12 though, so it wasn’t an entire loss. Anyway, looking at this agenda using Google Slides, if you are doing “housekeeping” things the first 10 minutes or so, how are you also conducting “Tucker Time” with a group? I’m just trying to wrap my brain around how to do this with 5th graders who aren’t as independent as high school students. I’m not sure I understand your question. If you are looking at my example, the class starts out with a “welcome activity or admission task” then we go into station rotation model. During the rotation, I lead one station which I call “Tucker time.” The rotation takes approximately 60 minutes and we have a 90-minute class. I know this may take more training with 5th grade, but I have seen this work in younger classes. Last year I coached teachers who work with 3rd and 5th grade students who use this strategy. I love this idea! I will be starting a blended class in the fall and am excited to try out this idea of an interactive agenda. Thank you for the suggestions and the templates! You are so welcome, Teresa! I’m a new teacher not familiar with using Google in the classroom. I teach high school business, Photography, and Graphic Design. I would love to learn more about setting this up. I read your posts an am still not sure how this will work in Google. All my students will have a Google Chrome book. I starting these subjects from scratch and have nothing to draw from. The school will host training in Google but not until a couple of days before school starts in August. Can you help? I’m also looking to try to complete the Google Curriculum Map. I would recommend checking out the Google Certified Educator playlist on YouTube. It will walk you through how to use the various offerings (e.g., Google Slide) in the Google Suite. How do I embed into Canvas the slide I made and keep the links live? I am not sure what I am doing wrong? Can you advise? Does anyone use Canvas who can help Kate? To add it to Canvas, you should be able to click on “File” then “Publish to the Web” on the slide to get an embed code to add to a Content Page. All links should remain live. Yes! Make sure you are in “Edit HTML” mode on the content page before pasting. Here’s a video I made showing how to embed a Google Slides presentation into a Canvas page. Hope it helps! I’m a transitioning 5th grade to K-8 Tech/STEM teacher this year. I have VERYYYY limited time (30-40 minutes one time per week), and I believe this station rotation would work well. Do you have any other posts that you feel would be helpful? Also, how do you run your four corners discussions? I LOVE all of your ideas!! Thank you in advance for your time!!! This blog addresses some of the common challenges teachers face when implementing the Station Rotation Model, like short classes. I hope it’s helpful. 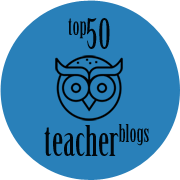 I also have a few other blogs that might be useful. 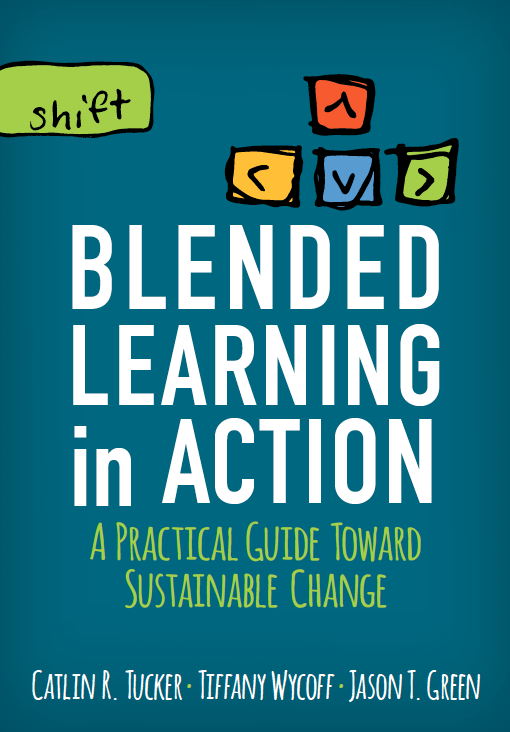 My book Blended Learning in Action may also be a helpful resource if you get really excited about the Station Rotation Model. I keep a running agenda through google posted in Schoology! Students love the opportunity to come in and get started! I have one template from last year, but look forward to changing it up this year. I love, love, love reading all your posts – and I love emulating some of the things you do. Could you share the template for the google slide agenda??? Thank you SO much! I apologize for the delay responding to this message! Below are two of my personal templates. I also team teach, so I’ve included a link below to one of our team templates, but it may not make sense since I co-teach in a team of three teachers. We integrate our curriculum and co-teach blending students together.